Age: 44, Virgo and Port Adelaide supporter. Most significant wine you’ve ever drunk: Saltram’s 2002 Eighth Maker Shiraz. How was it? Fantastic. 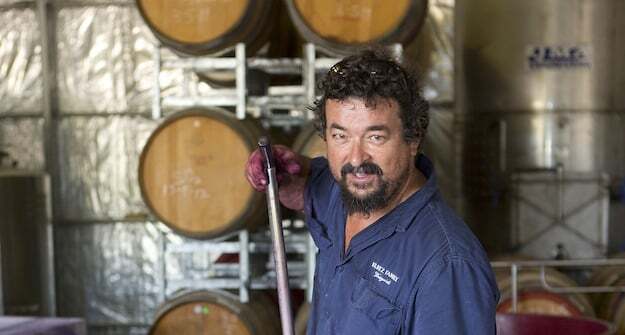 Was fortunate enough to drink it at a little fishing spot called Clare Bay, about 140 km’s west of Ceduna, out of a beer stein, that was all there was, with Nigel Dolan, the 8th Winemaker at Saltram’s. Wine you’re most proud of having been associated with the making of? The 1999 Lunar Block Shiraz. It ended up getting a Gold Medal at the 2002 Barossa Wine Show and was pipped for the Trophy by the 1998 Wolf Blass Black Label? and the 1998 Saltram No 1 Shiraz. Is there any wine you’ve been associated with the making of that, if you had your time again, you’d treat/make differently? I guess you always feel that there is something that you could have done differently, but nothing major springs to mind. Other than the wineries you have worked with, which Australian/NZ winery is best represented in your personal cellar? Rockford. What do you most love about the wine industry? The down to earth people, I have met some absolutely wonderful growers over the years, they are truly the most important people in the Industry, and without them we have very little. What do you most detest about the wine industry? The not so down to earth people, unfortunately most of these are people who should know better. People who take advantage of others. Any comments you would like to make in relation to the wine industry here or globally? With a little luck I hope the hardest times are over for the time being. Our greatest challenge is to ensure that as an Industry we come out stronger on the other side. Finally, the 2007 vintage is being described as a disaster. How did you fare? As a grape grower it was absolutely disastrous, as a winemaker I guess time will tell. My gut feel is that it will be okay but not great.